Corbyn – What drives his cult-like following or what makes a Corbynista? Well yes of course I’m no supporter of Corbyn as I’m a Radical Liberal but none the less the almost cult-like following Corbyn has is something I’d really like to at least understand. That some people think he is the saviour of the left is undoubtedly the case and that he is idolised by some is also a given, but let me throw a few things out there for debate. Firstly, in the last local elections as I was out and about campaigning and indeed cycling through West Lancashire and Sefton one thing really struck me; it was the Labour poster boards on properties of the well to do houses in fashionably expensive places like Aughton and Ainsdale. And I’m talking about communities where you all but had to have a Conservative Party membership card to buy a house in recent times. Yes I know there are many ordinary semi’s in these leafy communities but it was the Lab’ posters on the larger more expensive properties that struck me. Labour has always had members/supporters whom the left have called ‘Champagne Socialists’ but they were almost always Social Democrats and most of them would not have put Labour posters up on their properties for fear of upsetting neighbourly relations in predominately Conservative voting areas. Now with a Labour leadership and membership well to the left (whilst the mast majority of Labour MP’s are still Social Democrats) some of the wealthy Corbynistas are bedecking their high-end houses to flaunt their support for him. The obvious interpretation, to me anyway, is that despite a section of the left being utterly devoted to him Jez is actually not making the big impression on voters that you may expect, especially with us having a completely incompetent and fractured Tory Government at present. Of course this lack of a Corbyn bounce must surely be linked in some way to his bizarre support for the Conservative’s Brexit. Unless you are a unthinking disciple of Brexit we all know it will lead to a more poorly funded NHS, a weaker economy, job losses and the poor being made poorer. Not end results that you would expect socialist leaders to sign up to, yet by backing Brexit that is indeed what the present Labour Leadership is doing despite it also saying not a job will be lost via Brexit. What an utterly bizarre position for any party adopt, but for a supposedly progressive party! Words fail many commentators…………..
And here’s another link, which is more about the man himself and a book written about his surprising rise to become Labour’s leader. The other thing (you could say contradiction) about Corbyn is the support he allegedly has amongst young people; the very people who probably have the most to lose (other than the poor) because of his support for Brexit. I’m guessing here that they like his reinvention of 1970’s left wing policies such as a much larger welfare state with many state provided ‘free’ things paid for by taxpayers. But don’t those same young people want to travel outside the UK into EU countries to live and work there as they please? Don’t they want a stable economy that is able to support an enlarged welfare state? You can’t back Brexit and have a flourishing economy that puts money in the Treasury’s coffers to make a ‘most things for free society’ actually work in any rational way. Maybe re-nationalisation of the railways is a big hit with the young and indeed the wealthy? I personally have some sympathy with this policy although to hear some of the proponents of it looking back at British Rail through very rose tinted spectacles is a little bizarre as BR had as many bad things about it as it had good. That the organisation of our railways needs a big overhaul to get things right is a given but just recreating BR is probably far too simplistic an answer. So Corbynistas what drives you? Does it feel like a cult more than a political party? If you are old enough did you feel the same way about Michael Foot? What indeed is the Jez ‘X’ factor or is it something that can only be seen from the inside of New(er) Labour? What an odd set of results we have seen from Thursday’s local elections which were fought against the background of an appalling hard Brexit being promoted by both Labour as the Official Opposition and the Tories as our Government. Only the Lib Dems and Greens of the UK-wide parties could be clearly identified as Remain. 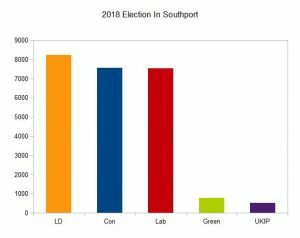 Locally in Sefton and in particular the Southport Constituency the Lib Dems gathered the most votes across the 7 wards yet they only won 2 of those wards – Meols and Birkdale. A big factor in these elections has been the almost complete destruction of UKIP. I saw an analysis of where the UKIP votes went and it was mainly to Brexit supporting Labour rather than the Brexit supporting Conservatives by a factor of 3 to 1. That may heap more trouble on Labour of course because it’s already struggling with racism problems and how is bringing more former UKIP voters into their tent going to help Corbyn grapple with it? But why did our utterly discredited Conservative/DUP Government not feel the electorate’s anger more in these elections? Probably because Labour are not offering an alternative on the biggest issue of the day (Brexit) and an Official Opposition that refuses to oppose is hardly likely to inspire masses of voters to switch to them.